Huge Savings Item! Save 15% on the Sasa Demarle FP 01066 Flexipan 1.15-Ounce Mince Pie Pan with 40 Molds by Sasa Demarle at Just Gathering. MPN: FP 01066. Hurry! Limited time offer. Offer valid only while supplies last. Demarle created a unique combination of fiberglass and high quality, food grade silicone: the Flexipan, a durable and long-lasting non-stick pan. Demarle created a unique combination of fiberglass and high quality, food grade silicone: the Flexipan, a durable and long-lasting non-stick pan. These flexible bakeware do not have to be greased and will still unmold without breakage. Depending on how it is used, this pan may be used from 2000 to 3000 times before the first signs of sticking and is temperature resistant from -40°F to 536°F. NSF, FDA, and Kosher Certified. Easy to clean--use a soft sponge and warm water. 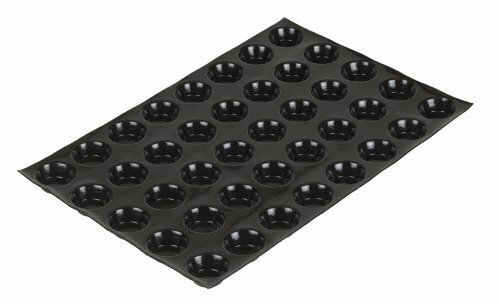 This Flexipan Mince Pie pan has 40 cavities, each holding 1.15 ounces. Each cavity is has a diameter of 2-1/4 inches and a depth of 3/4 inches. It can be used to bake any mini-pies, or any frozen desserts. Fits in full size 18-inch x 26-inch pan. Made in France. De-panning baked items: Remove the pieces one by one or by gently lifting the Flexipan to allow them to roll off the tray. De-panning frozen items: Peel the item out of the molds. Frozen items must be depanned two to three minutes at the latest after coming out of the freezer. De-panning cakes: For cake molds, turn the mold upside down. If you have any questions about this product by Sasa Demarle, contact us by completing and submitting the form below. If you are looking for a specif part number, please include it with your message.